Description: In recent decades, biblical scholars have often drawn from the wells of literary theory when seeking to better understand the art of biblical narrative. This innovative work adds to these insights by applying film theory to the analysis of story in the Hebrew Bible. Kent argues that film theory helps us to attain much greater clarity in our appreciation of the functions of narrative repetition. This book offers a synchronic exegesis of Saul�s night visit to the witch of En-Dor (1 Sam 28:3�25), focussing on the web of repetitions of visual elements, of symbols, of sounds, of entire scenes, and of keywords. Kent shows how an artistry of repetition and non-repetition helps to build characterization, plot, and structure, as well as prophetic fulfilments, foreshadowing, and inter-textual warnings. Anyone interested in biblical narrative and the Hebrew Bible will find here new questions and techniques, and a wider repertoire of tools offering fresh understandings. 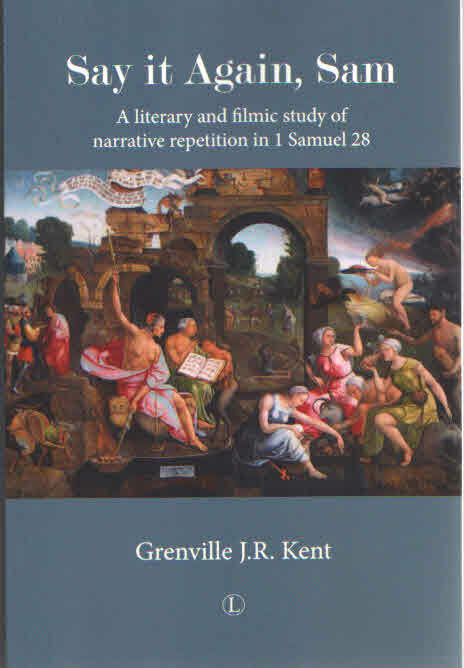 Citation: Andrew Steinmann, review of Grenville J. R. Kent, Say It Again, Sam: A Literary and Filmic Study of Narrative Repetition in 1 Samuel 28, Review of Biblical Literature [http://www.bookreviews.org] (2013). Citation: D. Lowdermilk, review of Grenville J. R. Kent, Say It Again, Sam: A Literary and Filmic Study of Narrative Repetition in 1 Samuel 28, Review of Biblical Literature [http://www.bookreviews.org] (2014).